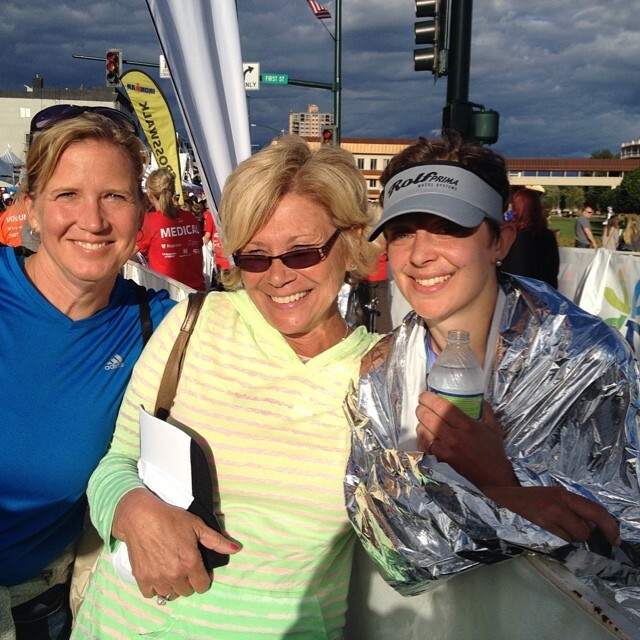 2014 Coeur d'Alene Race Report: Jessie Stevens nabs two massive PRs! I’m not super active on the forums but I appreciate all the you all and EN have done for my triathlete skills. My goal is to get to Kona and I think I took a big step in that direction this year. Thanks for everything!! “To accomplish something extraordinary, one must have an extraordinary dream. A goal so high, a journey so demanding, that it’s achievement to most seems impossible. Ironman® inspires us to re-imagine our limits, to set sights higher, to go farther than we ever have before. Ironman® is a statement of excellence, passion, commitment; it is a test of physical toughness and mental strength. Ironman® is about persevering, enduring, and being a part of something larger than ourselves. Above is an excerpt from a motivational video Ironman® put out a few months ago. I honestly can’t tell you how many times I’ve watched it and repeated those words to myself in the time leading up to Coeur d’Alene. I love it. It pumps me up and the entire video is made up of clips from the World Championship in Kailua-Kona, HI. Needless to say, my ‘extraordinary dream’ would be qualifying for and competing in Kailua-Kona – let’s just get that out there right away! I knew it wasn’t going to happen for me this year, but that Coeur d’Alene would be part of my journey. Over the last year, I have become a more skilled swimmer, stronger cyclist and runner, and gained much more mental toughness and overall self-confidence with my ability to set and achieve difficult goals. The week or so before the race, I was calculating the given amount of uncertainty in performance and execution on race day (a number of things could go wrong: mechanical issue on the bike, nutritional mishaps, GI issues, etc.) and I was moderately concerned with recent missed or incomplete workouts following our move and starting new jobs. Danny and I had many conversations about this and I took comfort knowing my head was in the right place, I was more prepared that last year, and no matter what happened, I was going to enjoy the day. This was my only planned Ironman® in 2014, so I had one chance, one day, to show myself what my hard work over the last 10 months was for, to cross that incredible finish line, and to hang out with 2000-ish other triathletes as we conquered 140.6 miles! Danny and I left for CDA on Thursday morning. As soon as we arrived, we headed over to registration, got checked-in, picked up packets, went to check out the lake, and posed for a pic near the beach. Then we headed for our condo to meet Danny’s mom (Grace) and dad (big Danny). It was awesome to be able to enjoy the weekend with them and big Danny was racing with us for his first full Ironman®!! It was very cool to be able to race with multiple family members and to share that first-timer experience as well with my father-in-law. That night we met up with another cycling turned triathlete friend of ours from Roseburg OR, Steve, who was also racing as a first-timer, and his family for dinner on the lake. We talked non-stop about the race, what to expect on the course, ate well, and returned to the condo to get some good sleep. Friday morning the three of us headed over to the lake to meet up with the Endurance Nation crew (the team Danny and I are coached through) for a quick meet/greet/pic, then into the water we went for a little swim. The water was a little chilly at first, then you warm up, and it’s awesome. I’m definitely in my happy place in that lake. The water is clear and the landscape around the lake is beautiful. It’s a comforting feeling. After our swim, we returned to the condo, ate some food, waited out the rain, then took off for a little course preview spin on the bikes. Later that night we had dinner downtown, attended the Welcome banquet, and then headed home for a good nights rest. Saturday we packed our transition bags, cleaned and double checked bikes, and headed over to transition to drop it all off around noon. The rest of the day included eating, hydrating and laying around watching movies. We went to bed around 8 with alarms set for 3:30am. We woke with the first alarm and I started eating my breakfast cookie and drinking my sports drink right away. I also had a banana, part of a bagel with peanut butter, some dried mangos, and water. We got dressed, I slathered on sunscreen, and we headed to transition. We noticed right off the bat that it was windy. The trees were being blown around pretty good and I knew that meant the water must be pretty choppy. It was, but what do you do – it’s supposed to be a challenging day, no need to worry! After filling up tires, water bottles, checking bikes and transition bags, the three of us headed out of transition to hang with Grace and meet Steve. We watched the Pro’s start, used the bathrooms, then said our goodbye’s to Grace and headed to the transition area to get on wetsuits. Big Danny, Danny, and I all got in the water to warm-up together. Water temp was about 62 degrees and it was choppy with the wind. We got acclimated as much as we could, said goodbye to big Danny (he was seeding himself in a different swim time than us), then Danny and I headed over to the 1:00-1:15 corral. Given my swim times in training and racing half’s this year, I was thinking I could swim a 1:15. There was the usual Ironman® swim contact – kicking, hitting, grabbing, swimming on top of others – with the waves. I heard one volunteer kayaker say there were two foot swells at times! My time wasn’t quite what I hoped for, but it’s still an improvement from last year. If I hope to qualify for Kona, I’ll need to take 10-15 minutes off this time!! Nothing special. I struggled trying to get my arm warmers on and gave up, which was a decision I was happy with. I didn’t really need them. The wind wasn’t so bad on the first/shorter out and back on the lake. It was present, but noting to complain about. As soon as we came back through town and headed out on the second/longer out and back the head wind was a major factor. It felt like 30mph winds at times and I read sustained 25mph headwinds. It was no joke for sure. Depending on the day, I will have a different mantra on repeat in my head. On this day it was the words by Johnny Mellencamp “it hurts so good” thanks to Ironman® for playing the song as we were lined up on the beach prior to the start! So for the better part of 20 miles we mostly climbed with a killer headwind and I sang a fraction of the chorus from “Hurts so Good” and thought about how sweet my Rolf Prima wheels were as were cutting through the wind J Then I hit the turn around, had the wind at my back, and flew back to town, only to do the whole loop one more time. I was a little slower on the second lap, but not terribly slower. It was the same story with the wind on the second lap as well. I followed my nurtirion plan perfectly. I consumed my two Heed/gel combo bottles with approximately 590cal/bottle, drinking water as needed. I had 3 of the ½ bananas on the course as well. My bike split was about 5½ minutes faster this year than last. I’m actually pretty happy with this considering some the pro women’s times from 2013 to 2014 were about 15-20 minutes slower! Even Heather Wurtele, who was the winner in 2013 and 2014, biked about 15 min slower this year. My feet hurt which is typical, but got over it quickly. This is where I refused to give into the fatigue and pain as I felt I did at CDA last year! I tried to keep steady at about a 9min/mi pace with a little walking at aide stations – drinking water and cola mostly with a few chips around half way. It always feels fairly decent on the first 10-13 miles, then you go out for lap #2 and it gets tough mentally and physically around 17-21miles. I hung on for what I could, did my best to run and not walk, and am very happy with how my run went. I had an Ironman® pr of over 28 minutes and a CDA pr of over 53 minutes! I feel total redemption after last year as I had some regret from not pushing myself hard enough on the run. I saved my emotions for the finish. I had the plan to not let myself get choked up when things got difficult or when I saw my husband on the run this year, and I didn’t! We shared a few embraces on the run, but we meant business and we both pushed to amazing pr’s!! My first goal was as usual, finish and have fun doing it. Check. My second was to go under 12:30. Super check! I shattered that and am confident I can do even better!! My third goal was to place in the top 20. Check – 10th place in the female 25-29 age group!